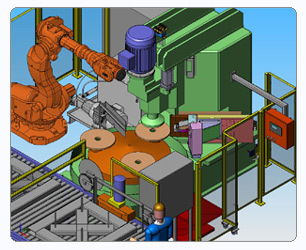 Welcome to the Automated Production Machinery Ltd. website. We hope that it will serve as an introduction of our capabilities & methods. Once you have finished reviewing the information contained here, we encourage you to contact us by phone, fax or email and permit us to address your specific needs directly. Automated Production Machinery Ltd. (APM) designs, manufactures and integrates custom machinery, automation equipment, machinery rebuilding, workholding fixtures and precision gauges and gauge systems. We offer complete in house mechanical, electrical, hydraulic and pneumatic engineering, design and manufacture with a particular emphasis on servo motion control. From completely automated turnkey production machinery and/or automation assembly equipment to simple hand loaded workholding fixtures and gauges, APM is your best choice for design and building projects. Our innovative and robust designs, precision machining and controls expertise enables us to consistently provide our customers with dependable, long lasting equipment. As all work done by Automated Production Machinery Ltd. is custom, we encourage you to contact us by phone, fax or email to address your specific needs. © Copyright 2011 Automated Production Machinery Ltd.